Accu Chek Active Strips 100’s pack is an economical option for those diabetic patients, who need to test their blood sugar more than once in a day. Hence this is an economy pack for heavy users. You cannot use this strip box with other glucometer models. The current strip expiry date for our stock is April 2020. Also this pack does not include the black code chip. Black code chip is a substitute for the old green code chip for ever. That means you don’t have to replace the black code chip after the first insertion. Hence you need to use your old black code chip for life long. Ultimately your glucometer will become a no coding machine. All newly purchased machines will not have a slot for the code chip. So black code chip is only meant for old model machines. Also you have to understand that there will not be any strip expiry warning feature in your glucometer. Manufacturer of this strip is Roche diagnostics and it is manufactured in Germany. The volume of blood required for this test strip is very less. Hence only 1-2 μL is enough. With this strip, you can measure blood glucose level maximum 600 mg/dL and minimum 10 mg/dL. Accu Chek Active Strips requires capillary blood. If you remove the strip from the glucometer for blood application, then you can use blood from venous, artery, and neonates under specific conditions. You need to apply the blood on the middle of the test strip. The design of test strips are in such a way that it quickly spread the blood above that middle area. You can apply the blood in 2 ways. One is, by inserting the test strip in to the glucometer. Another way is by taking the test strip out from the glucometer. This option reduces the chances of contamination of the strip. If you are unable to apply enough blood on the strip on your first attempt, you have the option of re-dosing it. But this re-dosing should happen within the 10 seconds after the first attempt. Also this will work only when you are trying it by inserting the strip into your glucometer. You can check whether the strip is damaged or not and how much percentage it has damaged by a visual color check. There are 5 color block on your strip bottle for this purpose. When you are testing by inserting the strip into glucometer, range of Hematocrit is 20 – 55 %. This will be 20 – 70 % when you are applying the blood on the strip by taking the strip out from the glucometer. You can use this Accu Chek Active strips 100‘s pack till the expiry date. There is no need to complete the strips before 90 days after the first opening of the strip box. Accu Chek Active Strips 100 Nos. Once diagnosed with diabetes means diabetic forever. Though hope of adequate control without medications or even partial disease reversal is always there, if a person takes things in hands. Self-monitoring of blood glucose (SMBG) plays a central role in diabetes control and management. When comparing to acute conditions like heart attack or some acute infection, management of chronic diseases are quite different. In chronic condition, only those can expect to stay healthy who take things into their own hands and understand that doctor’s role is just of health adviser. So if you are a diabetic or have a family history or you are obese or above 45, you should buy an Accu Chek Active glucometer. This device is pretty straightforward to use and reasonably accurate. Best of all, Accu Chek Active strips 100’s pack is not expensive. Also they are within the reach of most of the people. But before starting to use Accu Chek Active Strips at home, there are few things to know. Before starting any medical procedure, or testing glucose with Accu Chek Active Strips, it is advised to wash your hands carefully and dry them with a clean cotton towel. Preferably one should also use an alcohol swab to clean the area of skin that he or she intends to puncture. Next step is preparing the lancing device. Insert the new, clean, and sterile needle into the lancing device and do not forget to check the settings of the device according to your skin type (most lancing devices can be adjusted for the depth or strength of prick, with thicker skin requiring stronger or deeper prick). Take a single test strip from the box and close the box immediately to avoid the contamination of remaining strips. Insert the test strip into the glucometer. Prick the end of your finger with the lancing device. A drop of blood will come out of it. Avoid milking the finger. If enough blood did not come out, better change the lancet settings. Put the drop of blood on the middle of the strip. Also ensure that there is sufficient blood for an accurate result. Your glucometer will provide the reading within seconds. Stop bleeding by applying pressure with the help of a cotton swab. Finally, it is worth knowing that blood glucose in whole blood or capillary blood is less than that in plasma. However, Accu Chek Active machines are calibrated to provide plasma equivalent blood glucose levels. Hence the results do not differ much from that of a lab test. In case you feel that your Accu Chek Active machine does not show accurate results, it makes sense to check the glucometer for accuracy with the help of standardized glucometer testing solutions. Also check whether the Accu Chek Active Strips are damaged or not by using the manufacturer manual. After testing the blood glucose, do not forget to store your Accu Chek Active Strips 100’s box in a clean place away from direct sunlight. Buyers need to contact the manufacturer (Roche Diagnostics) directly for availing Warranty. In one word Awesome!!! Been an online customer for Ecom for the last five years. This is the only person I trust for something as critical as medical supplies for my family. It takes a lot to continuously perform and build such a trust over all these years and every time Ecom has been outperforming themselves. I wish them all the best for the future and request them to keep up this great service going. Ecomsurgical is a reputable seller on various popular E-commerce sites. Glad to see that you started your own website and offering competitive price. I have been buying diabetes monitors and strips from this seller for years. The seller’s response to queries is second to none. The site is easy to navigate and place order. The shipping speed is incomparable. 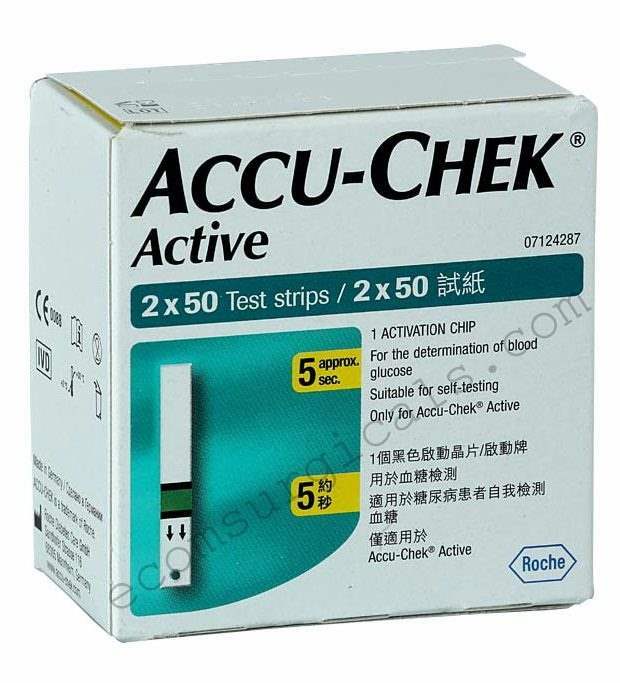 Very recently, I ordered Accu-check test strips and it was delivered in 48 hours though I live in a remote village. I recommend it 100% due to competitive price, quality assurance of the product and probity of the seller. I have been purchasing from Ecomsurgical for almost 3 years already and I wanted to give a review of what they truly deserve from their great service and awesome product. First, is the product, ACCU-CHECK Active Strips, is a very useful tool in measuring and keeping track of the blood glucose. It is very suitable for self-testing that only requires little volume of blood. The product works well and I am happy to say that it met my expectations! I like it very much for this is cheaper than what I usually bought from other portals. Second is the service. This is what I liked the most because as a customer we would always want a great deal of service and indeed they have. Such as an extremely fast shipping and an unbeatable product quality. The products I ordered arrived on time in an excellent condition. The boxes came secured and the expiration date is convenient. Also, they are very responsive when it comes to answering queries. Lastly, the price. I am glad to say that I am willing to invest and spend my money not only because of the quality of the product and the excellent service given to the costumers but because the price is very reasonable. Keep up the great service going and your quality products because I will surely come back for more, inviting all my friends who will also love your products. I wish you all the best in the future and I hope that you will also be a great help for customers like me. I have recently purchased Accu Check strips from ECOM – it was a great satisfying experience, quick & prompt service including delivery, nicely speaking staff support (from Mr. Shabu) etc. I have no hesitation to recommend your products to my friends as well. I am happy because they have provided me the promised expiry date product (August 2019). Got sealed pack and very well packed. Seems to be a new website, but service standards are highly superior. Very cordial with customers and true comrades. I liked your concern for customer satisfaction and I request you to keep it up, always. I ordered AccuChek sugar test strips on August 14, 2018 and was monitoring this order. Unfortunately there was flooding in Kerala and the delivery to me was delayed. However they (team Ecom) was regularly updating me through WhatsApp. Finally I received the product on 27-08-2018 and I sincerely admire their services. It was not easy to send the product in such an adverse situation but they made it. I wish them all the best and I will certainly get back to them for my future requirements. The product was shipped immediately after the payment and delivery was as scheduled. The price was very competitive and lowest. I will certainly recommend and get my future requirements from them. Very good product offered at affordable price. The price is less compared to medical shops and other ecommerce websites. Delivery is also very prompt. prompt delivery, competitive price, friendly representative & long expiry date of products. I had the fortune of interacting with the team at Economic Surgicals for Test Strips for my Accuchek Glucometer. They are very pleasing to interact and customer driven. They guided me with utmost professionalism and objectivity. Outstanding website that is browser friendly and fast to get to your needs. Very clear pricing and procurement options. Congrats !! !